Sabash Engineering (Chennai) Pvt. Ltd.
M/S Maurice Engineering Works Pvt. Ltd. specializes in complete building and maintenance of plant equipment which is complete dismantling, overhauling and re-erection of Process Fans. TarGett International Sales & Marketing Co. Besides axial flow and centrifugal ventilation fans, we offer special purpose centrifugal fans for high temperature, fume/vapour exhaust, dust handling, material conveying, induced draft & forced draft applications. There is no better name in the Indian Industry than 'Andrew Yule' when it comes to process fans for any conceivable application. As their authorized business associates, we deliver the best in class fans to all our discerning customers. 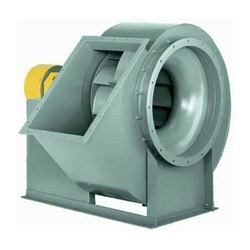 Process air fans are an important component of machines and plants. In these applications they ensure functions that would not be possible without defined air transport. Of these specially developed, robust fans there are several standard ranges and a number of customized solutions. some fan types are designed for process applications such as boilers, incinerators, pollution control and high pressure systems. Various blade types are matched to application requirements.